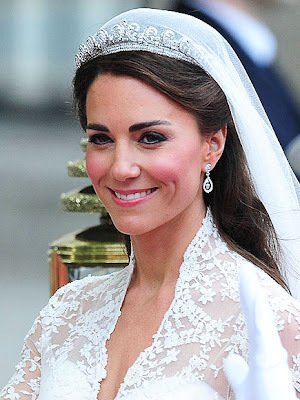 It has been widely reported that Kate Middleton eschewed the services of a professional makeup artist on her big day. The world waited with bated breath to see the dress. It did not disappoint. 1950s inspired; surprisingly modest - and her sister Pippa in a wedding gown too! Which one will be copied more for future brides to be? The makeup was a more garish version of her signature look. I applaud the deeper blusher, it looks much better and helps make her a little more youthful. But.... that heavy liner! I think it would have been nice if she had allowed a makeup artist to gently illustrate that heavy liner is not the only way. And smoky eyes on a wedding day just seems wrong to me. 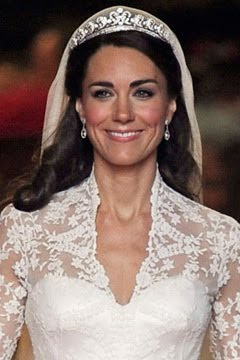 The gown has been accurately compared to Grace Kelly's wedding dress. If only the makeup had echoed that too. I would have loved to see Kate Middleton in soft eyes, blushing cheeks and a rosey red lipstick. Above: The Kiss - with that hysterical bridesmaid (Grace Van Cutsem.) 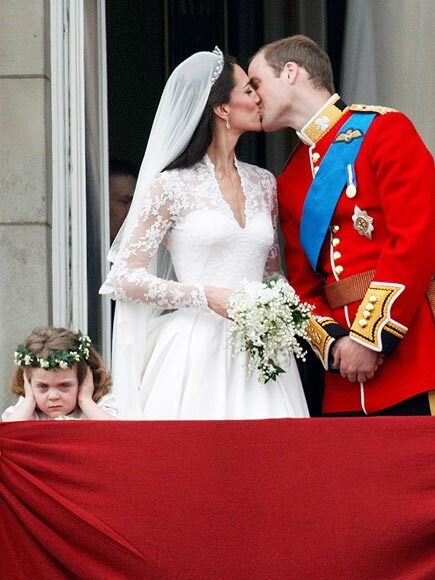 As Vanity Fair wrote, "Wedding-weary Republicanism could not have hoped for a better public face. " The bride did look beautiful, and what''s more, she looked very comfortable and confident. 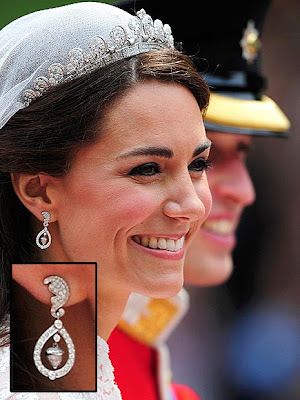 By all accounts she kept saying she wanted William to "recognise" her, so hair and makeup was not allowed to deviate from the norm. ...What did you think about the makeup? PS. The makeup was reported to be Bobbi Brown. i agree with you, i think she should have got a make up artist to give her a soft, dewy, fresh look rather than those heavy smokey eyes. Would have been miles better. am very surprised she didn't use a makeup artist. Even I got a professional job done on my wedding. Having said that, I don't agree with you. I think she still looked fabulous and very natural with the makeup she did on herself. Illamasqua continue to Establish themselves!